Finding a Two Hundred and Eighty Year Old House Ruin Admidst Suburban Sprawl? The era of the big box store has presented a conundrum for many places planning, the consumer convenience and pricing have driven a wild success in repeating these retail locations across the country, and they grow increasingly larger in size and offerings, and in recent years have driven down the commercial success and increased competition with retail grocery chains which typical operate on already thin margins. This situation presents itself in Frederick along Route 26 on the north side of the city. A large but previously routine size Walmart was built less than a decade ago south of Route 26 and has been quite successful and its location and impacts generally favorable, although the promise during development review that the expanses of parking surfaces would not cause excessive storm water runoff issues has resulted in an unplanned, large perennial pond on city parkland below the location. It has an informal name, spoken often with amusement, as a sort of developer’s folly. But even that effect is fairly benign and attractive ancillary result of the building. 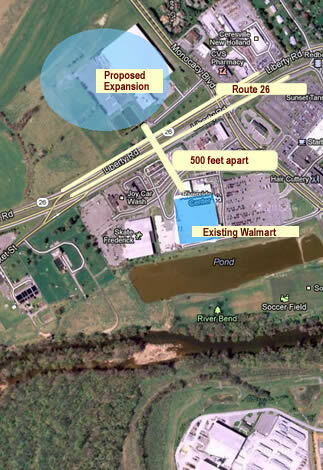 Now, Walmart insists that it requires a massive new building on the immediate north side of Route 26 to expand to grocery operations. Oh, and plans suggest some townhomes overlooking the rear parking areas, one can imagine grilling out and your deck and watching shoppers come and go, but at least the charcoal will be handy to purchase. In addition, the traffic mitigations are really more intrusions upon an already congested area, with a request for a Route 26 entrance. Worse, the planners and city have already approved a text amendment that the developer suggested for reduction in parking mitigation of green space and runoff requirements in order to increase parking and reduce costs. A bit of a battle also rages in Harford County in Maryland, where a larger store is sought and the County Executive requested Walmart not build a large site. Walmart response was negative and has called proposed legislative reviews sought to be added by the county an assault on business. Critics of these big box retailers have been varied in their complaints. But one that stands out for Frederick is the conundrum of what happens to an abandoned big box once sitting empty and discarded by its former owner. The answer has often been a decade or more of decay and a scar on the municipal landscape that cannot find use real useful purpose. There was a time when large antique operations loved these massive cavern spaces, but that business seems to have been in decline in the era of eBay and youth whose electronic life does not seem to take note of old items as valued heritage. So Frederick seems likely to stand for a double wallop in these regards. A large, empty, useless space with a mothballed structure and the neighborhood impacts, on top of an already difficult transition on the north side to a variety of dense retail complexes that offer few smart growth benefits. I am not the greatest fan of Walmart; it serves its purpose as retail for me, though with some regret and concern for the loss of things like real hardware stores and more small business opportunities and the reduction of competition. But I am also not its greatest critic, as any community welcomes the lower wage retail jobs for folks who find them a welcome fit to their employment. And while a private business has its place and purpose, it is the place and purpose of government to regulate the location, impacts and accommodations of the business needs and the residents quality of life. Why do our leaders bend over backwards to change the rules for one property? That is poor planning. Yes, sometimes creating exceptions and allowing a change may make economic sense, but not when it tags on an albatross of built and likely useless previous development. And what becomes of the strip of retail stores cattycorner to the new expanded Walmart if the grocery competition drives away a now marginally successful grocery? 2004 - 2012 - All Copyrights Reseved.